Guthrie Castle is a 15th century castle with beautifully manicured walled gardens, perfect for outdoor weddings. An exclusive use venue, it has a 200-seat pavilion, 22 bedrooms and a private 9-hole golf course. Guthrie Castle is a perfect setting for your special day. The estate, which is offered on an exclusive basis to ensure your privacy and security, really is a fantastic location for wedding receptions, set, as it is, in 156 acres of outstanding natural beauty. The Castle grounds include one of Scotland's most significant Historic Walled Gardens, dating back to 1614; it is beautifully sculptured in the shape of a horseshoe - with our Bridal Aisle through the centre of the ancient yew topiary hedges where we often hold the wedding ceremonies. 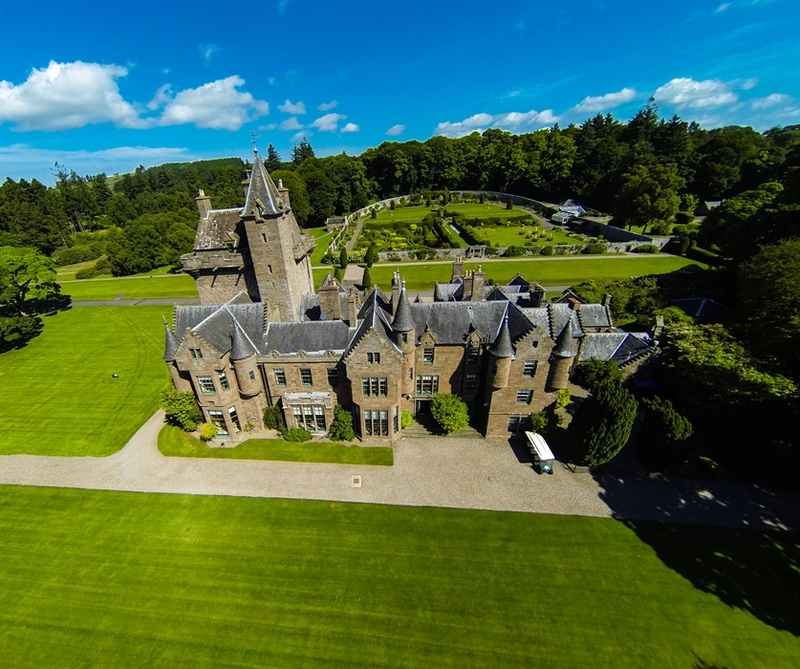 There are magnificent lawns, a private loch and a 9-hole Golf Course. Photographers call it their dream wedding venue and that's why you are guaranteed an excellent album or DVD to look back upon and remember your special day. As an alternative to a wedding ceremony in the Walled Garden, we have our own delightful chapel for smaller weddings or, for larger parties, we make use of Guthrie Village Church, built in 1150, which is only a few minutes walk from the Castle. We provide only the highest levels of service and comfort; we want you to feel very much at home within the beautiful surroundings ensuring that your special day will be happily remembered for the rest of your lives. Inside the Castle guests can wonder around the magnificent entrance hall, the elegant drawing room, library and fine dining room. They will also be able to see the trophy room, chapel, ladies sitting room and a number of the bedrooms. Walled Garden Getting married within the historic walled garden is a breath-taking encounter. You get pulled into an enchanted kingdom upon entering the gates. For those couples searching for a unique location to host their wedding ceremony outdoors, Guthrie Castle's walled garden is unrivaled. 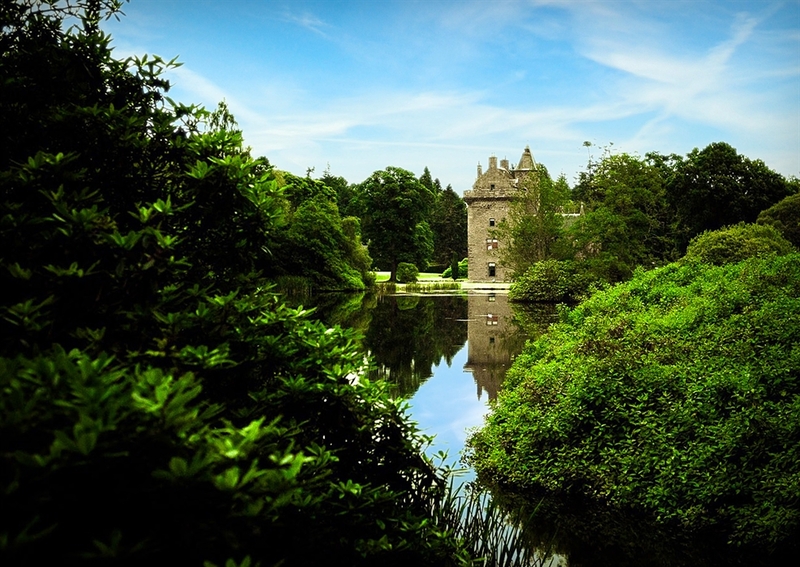 The combination of nature and castle create a breath-taking landscape that is in perfect harmony with the enduring structures which just magnify a more romantic feel and sophistication that is perfect for that once-in-a- lifetime wedding date at the altar, renewal of vows, merry-making with friends and loved ones. 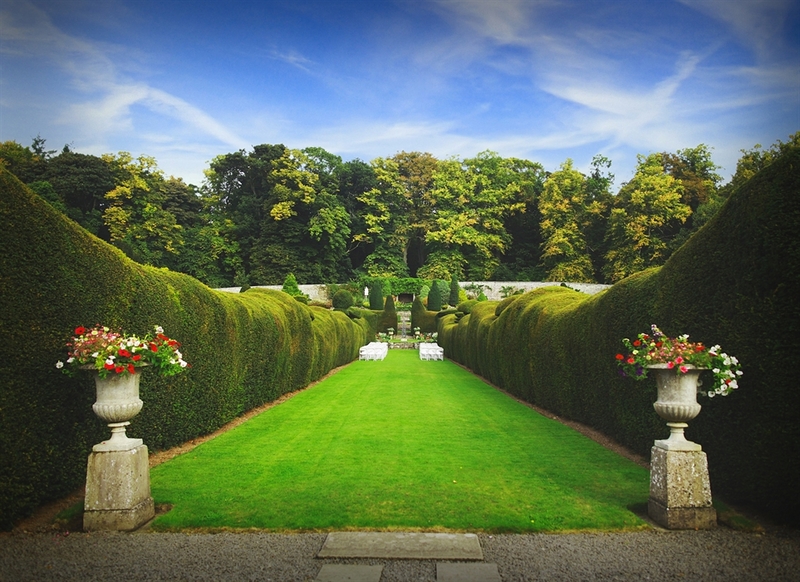 The 2.2 acre Walled Garden dating back to 1614 is complete with its own Bridal Aisle and Red Carpet for ceremonies. Large lawn area with wooden furniture for the reception drinks which includes lawn games such as croquet and bowls. Up to 32 guest can be accommodated overnight on the estate and, best of all, you can plan a outdoor wedding ceremony in our stunning walled garden in the knowledge that should the weather force us to move indoors we can either make use of one of the main reception rooms in the castle, or for small groups our own delightful chapel. The Pavilion As the Scottish weather is unpredictable, Guthrie Castle boasts having its own purpose built Pavilion, designed for the weddings it has everything your guests would require to enjoy the events of your day. The large function room, which can seat 40 - 200 guests for the wedding breakfast, can be elegantly divided for your wedding numbers. Additional evening tables and chairs can be added for up to 300 guests at night leaving the dance floor untouched throughout ready for the evening dancing. This means all of your guests can stay at their tables throughout the whole clearing process and for the rest of the evening. Built in 2005 it has been decorated for any taste to suit any colour theme that you choose for your day. It is also complete with the band's stage, integrated ceiling speakers, wireless microphone and disco lights. Further to this, all of the spotlights in the ceiling can be dimmed to create just the right atmosphere - ¦very romantic when all of the tables are candlelit. Connected to the main hall is the Pavilion bar with its own seating area, where guests can order drinks in a little quieter environment. Surrounded by natural beauty the main hall doors open out onto the patio for those warm summer evenings. The Pavilion is also complete with its own state of the art kitchen, so our caterers can cook your meal on-site on the day. Golf Course Our course is available for our privately booked weddings and events only. Golf course architects always try to build 'signature holes' - we are fortunate that the natural landscape around the castle has provided us with a number of such outstanding holes. The 4th, 5th and 9th are stunning - both visually and from a golfing point of view. The Laird's Course was originally built in 1995 to celebrate the Laird's 50th birthday. An aerial shot of the majestic Guthrie Castle. An aerial shot of the majestic Guthrie Castle. The view of Guthrie Castle from the bridge and across the serene loch. Guthrie Castle's historical walled garden where many lovely couples have tied the knot.